Getting ready to leave for college is often one of the most exciting times in your life filled with the anticipation of living someplace new, decorating your dorm room, meeting new friends and gearing up for new academic challenges. 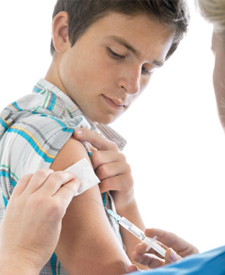 Way before you pack up the car and head for college you should make sure that you are up to date on all of your immunizations including talking to your primary care provider about whether the meningitis B vaccine is right for you! Meningococcal disease is caused by a bacteria called Neisseria meningitidis. The bacteria attack and infect the membranes that protect the brain and spinal cord. It is a very serious illness that can come on rapidly and even lead to death in just a few hours. The most common symptoms include: fever, headache and stiff neck or “flu-like” symptoms. Other symptoms include: nausea, vomiting, sensitivity to light, and confusion. Prevention and early treatment are very important! Living in close contact with others is a risk factor in coming in contact with meningitis therefore getting vaccinated BEFORE you leave for college is critical. Just like other vaccines, the meningitis vaccine isn’t 100% effective; however, it will greatly lower your risk of getting the meningitis types B, C and Y which are the most common kinds of meningococcal diseases in the United States. So, while you’re picking out your comforter and dorm room decorations, don’t forget to make an appointment with your primary care provider and have a check-up before you leave for college. Make sure you are up to date on all of your immunizations and ask if you should get the meningitis B vaccine.